SAN ANTONIO — This year was supposed to be different, Nolan Catholic’s Sarah Williamson said. The heartaches that previous Nolan teams felt weren’t going to touch this team. This was going to be the year the Vikings finally beat Dallas Ursuline Academy for the TAPPS Division I state girls soccer championship. But as Williamson stood with her teammates Saturday at Mata Stadium, it was apparent little had changed — most notably, the result. Sophie Campise scored two first-half goals, sending Ursuline past longtime nemesis Nolan 2-1. It was the eighth year in a row that Ursuline has beaten the Vikings in the state final. Campise had a lot to do with that. With her team benefiting from a strong wind at its back, the Texas signee scored twice in the first 23 minutes. She scored just 2:40 into the game, taking a pass from Emily Hoffend and putting a shot just under the crossbar. In the 26th minute, she headed in another pass form Hoffend, staking Ursuline to a 2-0 advantage at halftime. Nolan, though, pulled to 2-1 in the 65th minute when Morgan Ulliman put a low, line-drive shot inside the right post. But the Vikings (21-8-1) couldn’t net the tying goal. 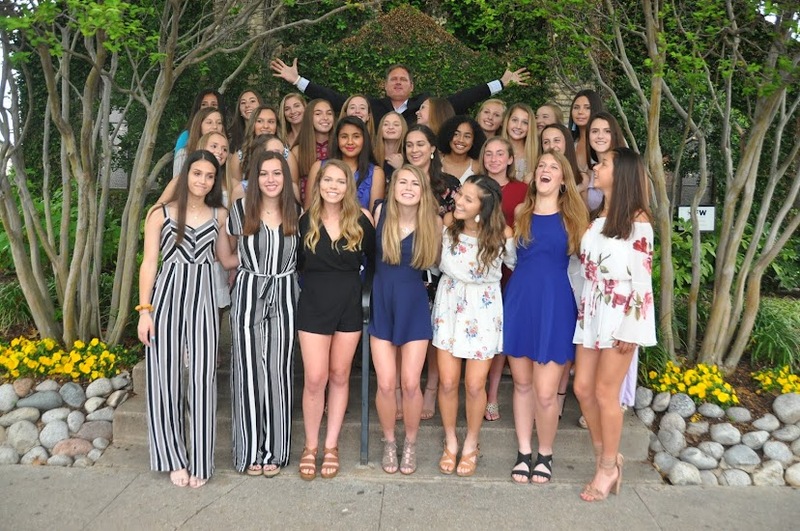 The Nolan Catholic Women's Soccer Team will play in the TAPPS State Championship tomorrow, Saturday, February 21st at 2:00pm at Mata Stadium in San Antonio. The Lady Vikings defeated Antonian College Prep today by a score of 4-0 on goals by four different players - Emily Grider, Morgan Ulliman, Sarah Williamson, and Haley Spotts. The Nolan Catholic girls soccer team enjoys national rankings, an elite showcase tournament filled with national powerhouses from California to Florida and Division I college signings every year. The boys program, well, they just seem to be consistent winners. 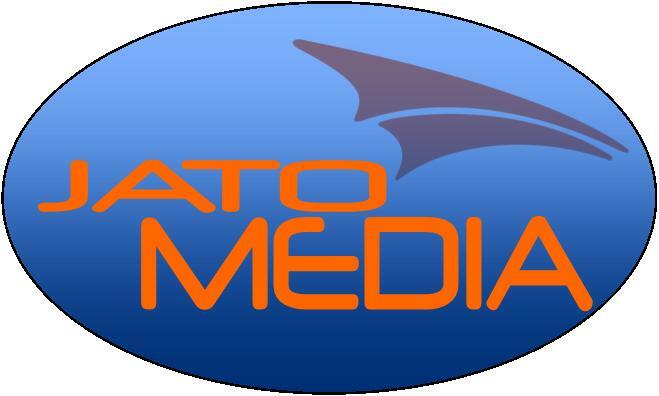 Both programs head to San Antonio for the TAPPS Division I state tournament beginning today. Yet the two teams that share the same practice field after school don’t seem to share the same identity. The girls program brings plenty of flash by regularly competing with the elite public school programs in the area and nationwide. The boys team seems for whatever reason to slide by in a quieter existence. "The boys have always been about getting out there and getting done," Nolan Catholic girls coach Jay Fitzgerald said. "They’re not all about the bells and whistles. The girls want to look good while they’re out there doing it." Boys coach Adam Clementson said he’s not bothered at all by the attention the girls program draws. "It’s been a blessing in disguise with the boys being a little bit under the radar," Clementson said. "... Of course I want the boys to have the best recognition possible but on a selfish point of view it enables the boys to keep focused on the task that they have set ahead of them." The boys team is undefeated (16-0-3) heading into a 5 p.m. matchup against San Antonio Central Catholic in the state semifinals. The Vikings own seven state titles, with the most recent one coming in 2006. The program accomplished its first of three goals by winning the Division I District 1 title and needs only two more wins to secure an undefeated season and the state title for its final two goals. Meanwhile the girls program, for all its success and attention still chases its white whale – Dallas Ursuline. The Lady Bears have claimed the past 18 state titles while Nolan Catholic (21-7-1) has finished second the past eight years. The Lady Vikings program has four state titles but the last one came in 1989. They meet San Antonio Antonian at 1 p.m. today in San Antonio. However, Nolan Catholic has reason for hope this season after knocking off Ursuline twice in district play. "I think the girls believe in themselves more than ever before," Fitzgerald said. "They say it’s tough to beat someone three times in one year but Ursuline’s done it to us before so why can’t we do it this year?" Nolan Catholic's boys soccer team, including Ryan Embree, is hoping to add to the school's state title collection. The Lady Vikings played host to Beaumont Kelly this afternoon in the TAPPS Regional Championship. Ten different players helped Nolan Catholic advance to its 8th straight Final Four. Morgan Ulliman, Emily Grider, and Kaytee O'Brien had 2 goals a piece, while Maura Kolkmeyer, Alex Rios, and Haley Spotts each added one. Sarah Williamson (3) and Mallory Baum (2) had multiple assists. It was a true team result. It took the Lady Vikings about 10 minutes to get into a rhythm before they got on the board 3 times in 90 seconds. That set the tone for the rest of the match - the final 17 minutes of the 1st half the Lady Vikings added 4 more goals. 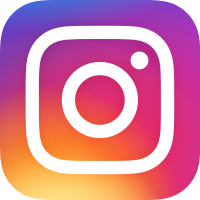 Other scores from the TAPPS Playoffs: John Paul was beaten by San Antonio Antonian 3-1, TCA was defeated on the road by St. Agnes 2-0, and Ursuline put 5 past Incarnate Word at Jesuit High School. The Lady Vikings will travel to San Anontio this Thursday to prepare for it's semi-final match vs Antonion College Prep at 1:00pm on Friday, February 20, as Ursuline will take on Houston St. Agnes right after at 3:00pm. Both matches will be hosted by Edgewood ISD and played at Frank Mata Stadium. The winners of the 2 matches will play for the State Championship on Saturday at 2pm. The Lady Vikings closed out the best regular season in program history with an overall record of 20-7-1 and a TAPPS District 1 Championship. 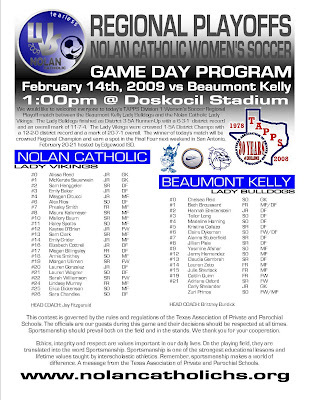 Nolan Catholic plays host to Beaumont Kelly as they come to town on Valentines Day. 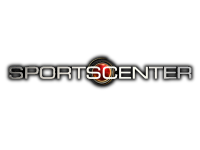 The game with be Saturday, February 14th at 1:00pm at Doskocil Stadium. The winner will advance to the Final Four the following weekend in San Antonio. Mallory Baum proudly wears #10 for the Lady Vikings and represents it very well playing in over 10 matches with over 170 points through 56 goals and 61 assists. She is a 4-time TAPPS 1st Team All-District selection and 1st Team All-State selection every year since her freshman year. She is a 2-time Nolan Offensive Player of the Year and a 3-time TAPPS All-Tournament selection. She adds multiple dimensions to the game and is dangerous on and off the ball. 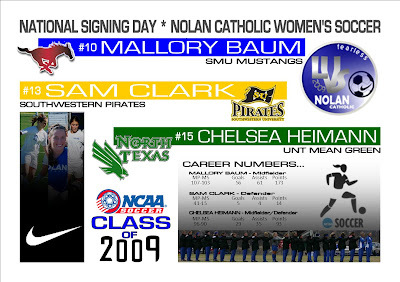 She will play college soccer for SMU in the Fall and they are very lucky to have such a gifted player. She was voted as TAPPS District 1 Co-Player of the Year this year. Sam Clark has been with the varsity program for the past 3 years and has been termed the “team mom” many times. She was the T-Award recipient last year and her selfless attitude is one of those intangibles that help this program be one of the most consistent programs in the country. She has been asked to wear many hats within this program and she does it at the drop of a dime—never complains, just plays. She has played in over 40 games for the Lady Vikings and will continue her soccer career at Southwestern University in Georgetown, TX. Sam Henggeler was put into the fire immediately 2 years ago after she spent her first 2 years with the JV—she saw her first real action in the TAPPS Playoffs her sophomore year and has been an important key to the success of the program since then. She has played in over 50 games for the Lady Vikings and was a TAPPS 2nd Team All-District selection last year and again this year. She was also Nolan Lady Vikings Defender of the Year last year. She is extremely consistent and her carefree attitude has helped the Lady Viking defense frustrate the best attacking teams in the country. 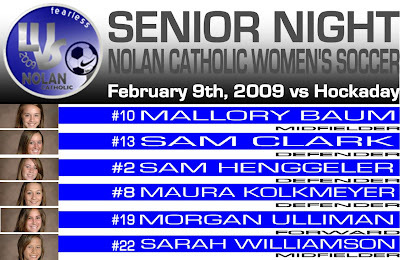 Maura Kolkmeyer has been with the varsity soccer program here at Nolan Catholic since her freshman year. She has played in over 90 games for the Lady Vikings in those 4 years. She along with many defenders in the program don’t stand out statistically but her consistent play has helped the Lady Vikings give up less than 1 goal a game in the past 4 years in over 110 games. She has gone through some injuries throughout the last couple years but has been able to battle back to play in whatever role she is asked to play. Maura’s dedication and commitment to the Lady Vikings Soccer Program is appreciated. Morgan Ulliman has experienced Lady Viking Soccer for just about 8 years now as she took over for her sister when she graduated 4 years ago. Morgan has been a varsity starter for the past 4 years—2 games shy of 100, scoring 54 goals and 23 assists for over 130 points. She is a 4-time TAPPS 1st Team All-District selection and a TAPPS 1st Team All-State selection in 07-08. Morgan adds a presence to the game that is unmatched by any opponent, she is solid in the air and can play with her back to goal or facing the goal. She will also continue her soccer career in college and is close to narrowing down which school that will be. Sarah Williamson has spent the last 3 years on the varsity soccer team and each year she continues to prove how valuable she is to this program. She has the ability to run up and down the field putting herself in many significant spots on the field. She has been very opportunistic in her goal scoring. She is one of those players whose workrate pushes the team over the top at times. Sarah has played in over 70 games for the Lady Vikings and has scored 22 goals and 12 assists for 56 points. She was a 2nd Team All-District selection this year. The Nolan Catholic Community lost one of its own. Mary Ellen Byrnes meant so much to the Nolan Catholic Community and so much to Lady Vikings Soccer. The program would not be what it is today without her support. Mary Ellen will truly be missed and will never be forgotten. Mary Ellen worked her eight years in the Athletic Office. She has been at NCHS since 1986. She and her husband Bob have four boys: Brian '88, Danny '90, Michael '96, and Tommy '00, all of whom played basketball and baseball. Bob and Mary Ellen have been involved with the Viking Club all these years and supported the Vikings. We ask you to continue to pray for repose of the soul of Mary Ellen, and to pray for Bob, her sons, her family, and the entire Nolan Catholic Community. Visitation at Thompson's Harveson & Cole Funeral Home starting at 5:30pm. A vigil service will be held at the funeral home starting at 7:00 p.m.
Mass of Christian Burial will be held at 2:00 p.m. in Hartnett Arena on the Nolan Catholic High School campus. Visitation will be held prior to the Mass starting at 1 p.m. This fund will provide tuition assistance to Nolan Catholic students. The Lady Vikings finished 4th in the Allison Horn Memorial - they defeated Flower Mound 3-0, Tyler lee 4-0, and lost to Plano West 2-0 in bracket play before advancing to the 3rd place game losing to Coppell 2-1. The Lady Vikings are off for a week prior to taking on Marcus on Wednesday, Feb. 4th and Wichita Falls Rider on Friday.